There is a blogger named Amanda [Running with Spoons], who is really awesome, mainly because we are we are Christmas Sock Twins. Seriously. Go check her out for yourself, now. This will be here when you get back. Each week Amanda hosts ‘Thinking Out Loud‘ – a Thursday brain-melt-down post of all of the random things floating in your head. They’re quite enjoyable for my brain-meat. Join us. 1 – Last Thursday I posted that I had an eye appointment that day, and was so [sarcastically] excited to work all day with dilated eyes. The dilatation wasn’t super fun (see below for photo-proof), especially because it was the first bright and sunny day we’d had in weeks. But, more not-fun, was that my left eye isn’t doing super awesome in the whole ‘being a good eye’ job. For starters, I just have TERRIBLE vision. Negative 7.75, anybody? And [to top off the low-vision cake] my left eye has developed a very bad astigmatism. Turns out I couldn’t see much of anything out of it, but hadn’t noticed – because my right eye was picking up all the slack. It took them about an hour of adjusting to find a suitable prescription for my left eye, at which point, I was almost in tears. When they told me my left eye was being ‘lazy’, I almost lost it. I thought I was going to have to wear a patch over my eye. Looking back, I should have just decided right then and there to become a pirate. Turns out, unfortunately, my medication that is working amazingly for my autoimmune condition, may be causing my left eye to bum out. Not okay. So, we’re kind of in limbo. I go back to the eye doctor in 2 months to have it rechecked. Hopefully it was just a coincidence. We’ll know more then. Until then, I’m looking forward to spending lots of money on new glasses, again. #endpityparty. 3 – As I mentioned on Tuesday [<– Caramel Butter Cream Icing. Go Now.] my birthday weekend was completely wonderful. I have a very fun new toy – a DSLR, and have spent lots of quality time with it this week. I also was able to spend much-needed quality time with the Husband this weekend. Much Needed. 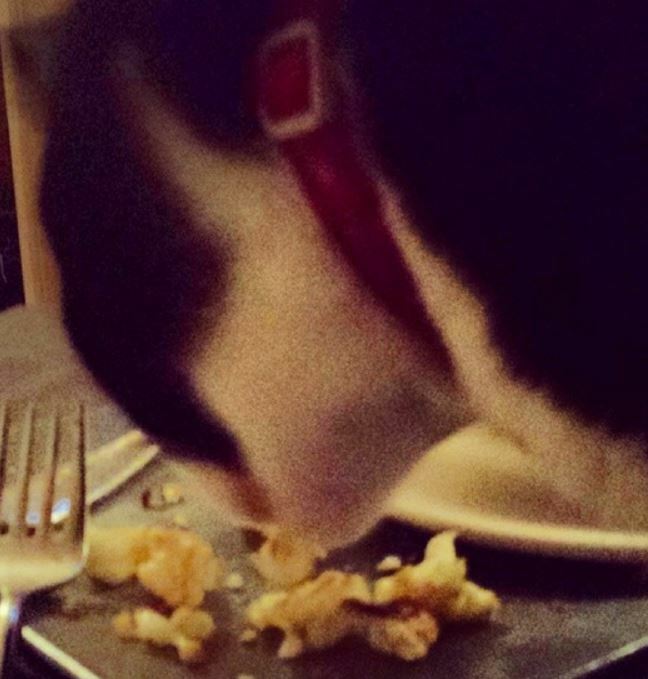 4 – Indy [The Cat] ate cauliflower this week. And birthday cake. Like. Stalked my plate and then attacked the birthday cake and ate it. (photo obviously not taken during the quality DSLR time). 5 – I was thinking about doing a blog post about my favorite kitchen appliances. Would anyone read that? 6 – For Christmas I got a FitBit Force. After wearing it for about three weeks, this happened. My skin began to react to the fitbit completely reject the fitbit being anywhere near it. When I would take the fitbit off, the swelling would go down, and within an hour of putting it back on, my wrist would swell, and a large red lump would form. And it burned. And it itched. And I’m going to spare you the pictures. Anyway, about the peak of my ‘maybe I should stop wearing the fitbit’ thoughts I found the [above linked] article about this happening to other people. I contacted the company, and they are issuing me a full refund for the product. They were incredibly responsive (within about 5 hours of my initial contact). They seem to think it may be a reaction to nickle in the product – but I’ve never had a nickle allergy before. It’s really more like a chemical burn. So strange. And, although it’s sort of strange that their product is apparently burning users arms, their customer service is excellent. 7 – Have you taken this dialect quiz on the New York Times? It’s really interesting, and even cooler because it was their most popular post of 2013, and it was written by an intern! 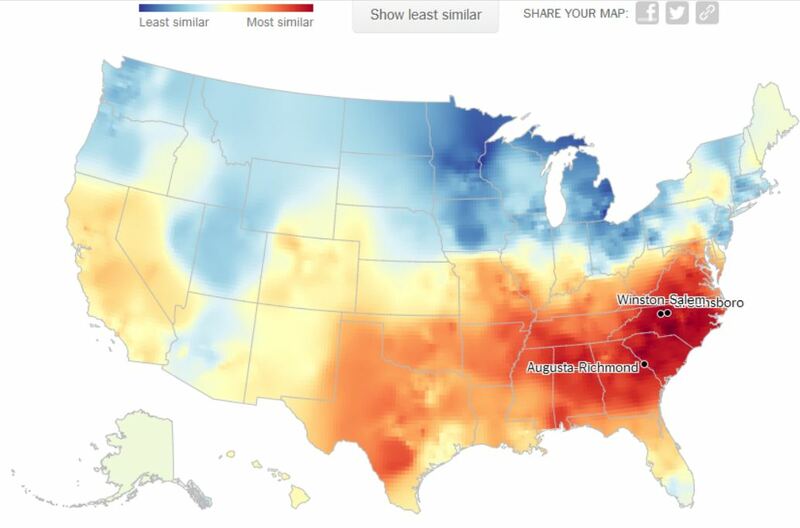 Where does your dialect match? Mine is trending a little more southern that I’m willing to admit. 9 – I have decided that smoke detectors and carbon monoxide detectors have a clock in them, but not for time keeping purposes, really only for the purpose of knowing that it’s 3:30am, and that 3:30am is the perfect time for the ‘low battery’ chirp to begin. Why doesn’t this ever happen at .. say .. 6pm? The battery in our carbon monoxide detector died Wednesday at 3:30am. And, since this isn’t the first time this has happened I, of course, had spare batteries. Spare batteries don’t do you any good, though, when this detector is located at the top of 16 foot vaulted ceilings. Perfect Storm. Chirp. Chirp. Chirp. 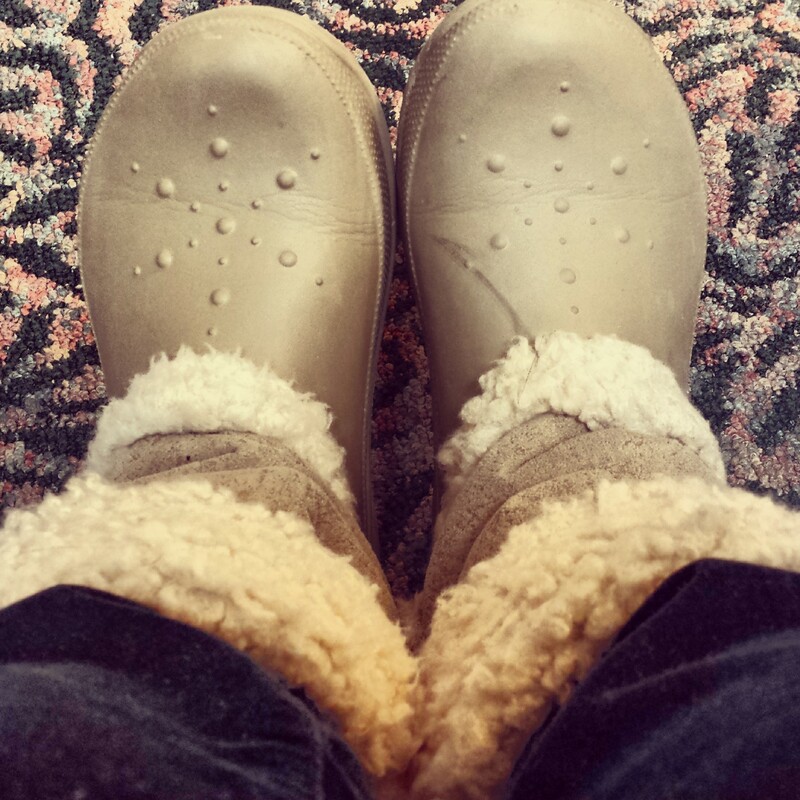 10 – Snow boots aren’t only good for hiding fun socks, they’re also awesome for wearing over pants that you shrunk in the dryer and are too short now. Slap some boots over them. Too-short-pants-no-more. Click here to join the Thinking Out Loud crew, and to read other people’s posts! 😆 #10 just killed me. Christmas sock twins and now short pant twins? DEFINITELY guilty of pulling that one, especially when it comes to skinnies. And how.freaking/adorable are you for “keeping your car warm” between two trucks. Omg… smitten with you. I am SO glad I’m not the only one to hide my short pants with boots. I love those green velvety pants, but they’re a good bit too short! The boots worked perfectly! 🙂 We are such twins! My little car started up just fine today, so the trucks must have helped. Maybe I should buy my car a blanket? #toofar. 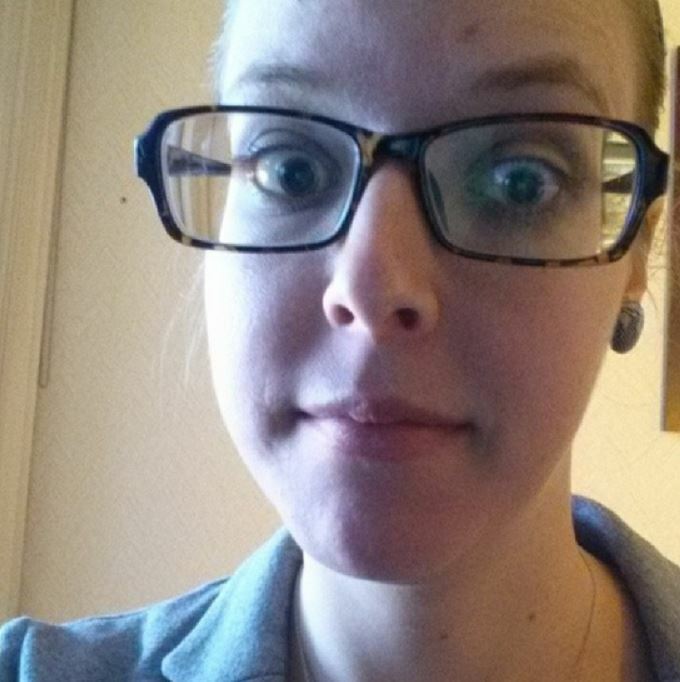 Ugh, dilated eyes are horrible – especially when the sun comes out! Love the short pants/boot idea – genius!! 🙂 The sun was horrible!!!! I was pretty proud of the idea – and glad I wasn’t the only one who’s thought of it before!